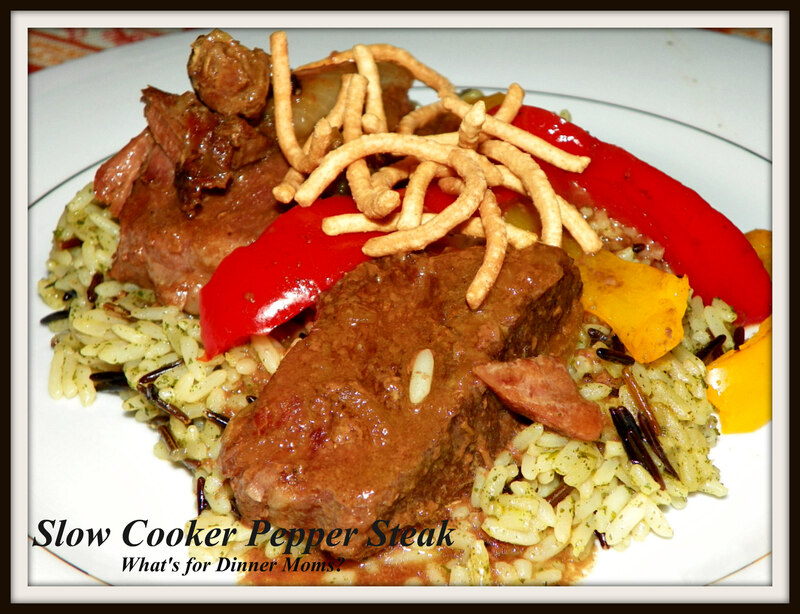 Slow Cooker Pepper Steak – What's for Dinner Moms? You know I love my slow cooker. Having a variety of recipes for it that are fairly simple and tasty are a life saver for a busy family. I found this recipe for Slow Cooker Pepper Steak on Recipe.com (click for link to original recipe). You know I encourage you to make a recipe your own and that is what I did for with this recipe. My family thought this was a great recipe. Check the saltiness for your family. I use a low sodium soy sauce and I was really worried about it being too salty for my family but it came out perfectly. I served over long grain rice cooked with beef stock and my kids ate it all up so there was nothing left for lunch the next day. 1. In 3- to 4-quart slow cooker, layer beef, onions and garlic. In small bowl, mix soup mix, black pepper and soy sauce; pour over beef. 2. Cover; cook on Low heat setting 7 to 9 hours or until beef is tender. 3. In small bowl, mix cornstarch and water; gradually stir into beef mixture. Stir in bell peppers. Increase heat setting to High. Cover; cook 10 to 12 minutes or until slightly thickened. Cover; cook about 5 minutes longer until peppers are cooked through. Serve over rice or noodles. Hope you like it as much as my family did! Yum! I will be making this over the weekend when our temps are in the 117-120. I will not be doing in cooking that involves turning on the stove. I like that you cook home-cooked meals for your family almost every night when you can. I try to do that too if at all possible, but seriously don’t have the time to blog about it, lol! You’ve been a great inspiration to me, though! Thank you. It is tough some days and my posts are much later on busy days. I love my crockpot too. This looks great! I am actually considering buying a new one. Mine hasn’t broken yet but I use it so much I am thinking I need an upgrade! I like the ones that are manual, not digital. Less opportunity for breaking.